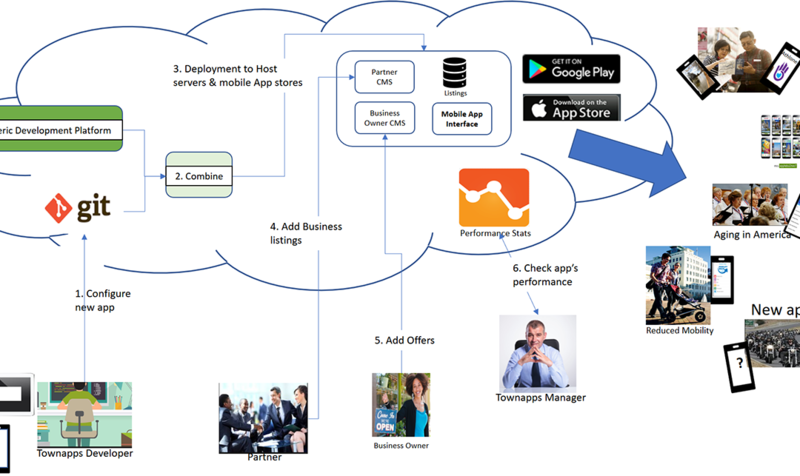 To rationalise development across hundreds of mobile apps, TownApps and SRI are creating a generic, configurable development platform that will allow a common code-base to be used for all common app functionality, with configurable elements to customise each app for a particular city or feature set. In addition to city configuration, the platform will allow optional features to be enabled as specified for each app type. By streamlining app development and management, time to market for new apps will be greatly improved as well as simplifying the app-store and infrastructure management of dozens or hundreds of separate apps. For all applications developed, the platform will configure the programme code for the specific app, compile the code into Android and iPhone mobile applications, and produce a docker image containing the application backend functionality and website for deployment to a VM service such as AWS. For deployment functionality, the platform will push the mobile apps to the relevant app store, deploy a VM for the application backend, and deploy the docker container to the VM. The application can be pre-configured, and automatically go live as soon as deployed, or app owners can configure the application with local business listings and additional content after deployment. The basic application foundation includes a city-configurable business listing database arranged by category such as Hotels, Restaurants, Places to See, Things to Do, etc. Users of the mobile app will be able to view the listings for a particular city including photos, detailed description and links to videos. App owners and business owners will be able to add and update business listing with photos, video links, descriptive text, and contact details including telephone, website and social media links. App owners will be able to add and remove business owners as well as recording business owner details for account management.